"TONKA originated in 1947 in Mound, Minnesota, originally created and manufactured by Mound Metalcraft (manufacturer of garden implements). The company began selling metal toys, which soon became the primary business. In November 1955, Mound Metalcraft changed its name to TONKA Toys Incorporated. The name TONKA comes from the Dakota Sioux word "Tanka" or Tonka, which means "great" or "big". In 2001, TONKA trucks were inducted into the National Toy Hall of Fame at The Strong in Rochester, New York. For almost 70 years, TONKA trucks have been the undisputed kings of the sandbox. Built on the notion that “a toy shouldn’t break just because a child plays with it,” they’re strong, sturdy and long lasting. Back in the '70s, TONKA even had an elephant stand on one, just to prove their point. Tonka ranges include My First, Tonka Steel and Climbovers." The 70 years history is key to Tonka's success - I didn't have the pleasure of having any myself, but I have read lots of reviews which attest to the durability of the toys, and the fact that they have been passed from generation to generation; indeed, they are guaranteed for life, brilliant in today's throw-away society. 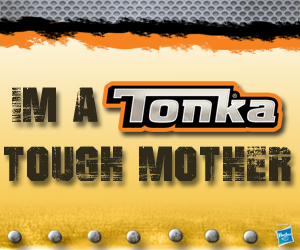 We were thrilled to have been chosen as one of Tonka's Tough Mothers in 2016. Tonka Diecast Big Rigs £6.99 This is a superbly detailed model that will really encourage realistic play - children will respond well to the exquisite detailing which will inspire all manner of imaginative games. The detailed lorry pulls a flat bed trailer which houses three removable storage containers; for added play value, children can substitute their own loads for transportation. The 10 wheels on the truck moves smoothly even on carpet. The trailer detaches from the truck and can be stood independently using the suspension. The excellent manufacturing quality means the vehicle will endure many hours of play and still look pristine This rig is built to last with realistic detailing, even down to the details on the wheels and the painted on rear lights. Tonka Diecast Monster Trucks £6.99 This is definitely one that copes with plenty of rough play. It will be perfect in the sandpit with its huge rubber wheels just built for rough terrain - it's great fun to build a course out of sand and create a fun scenario. I think ours is probably a fire truck, balanced carefully on the massive wheels. Again, the detailing is perfect and will appeal to children who want accuracy in their models - they really are good enough to be collectors' items. The Tonka Monster metal die cast collection was built for the extreme! Your favourite urban, construction, and emergency vehicles now sit atop massive, monster wheels which are really impressive. Tonka Tinys blind garages £1.99 These tiny vehicles are nonetheless intricately detailed, with just as much care as the larger vehicles, and this makes them a real delight.The Tonka Tinys range is a collection of palm sized vehicles that are perfect for little hands and a great introduction to the wider Tonka range. These are toys at pocket money or present prices, so children may well choose to build up their own collection. Amazingly, for the size, these Tinys have working parts - our mini helicopter has a working rotor blade. The garages double as storage boxes for the toys and they can be stacked together - makes a great display. 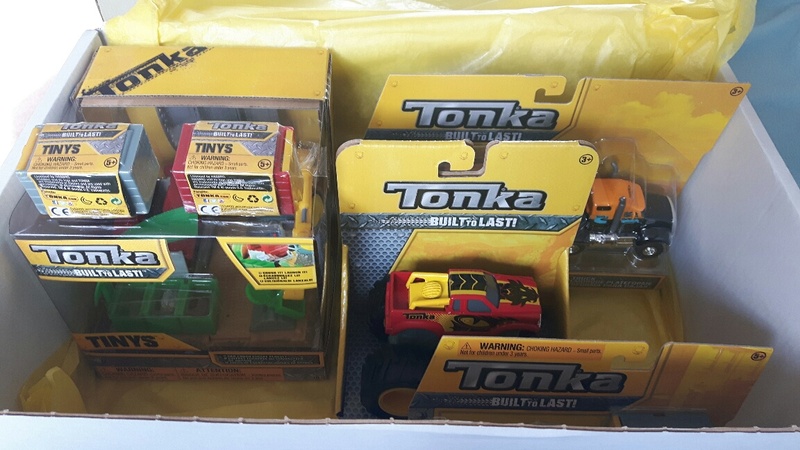 Tonka Tinys Three Pack Tonka Tinys three pack £4.99 - The Tonka Tinys Three Pack comes with two on display vehicles and a third which is a surprise! Children will love this and will be clamouring for more. Again, the models are beautifully detailed with working parts to really extend the fun and play value - encourage children to talk about their play. Tonka Tinys Mini Playset Car Crush Escape £9.99 - Take your Tonka tinys on an epic adventure through the car crush escape playset. With a working crane, car crusher and catapult - there's so much to enjoy in this set, and it will stimulate children's imagination with the working parts, The parts work well and give endless fun The car crush escape playset includes an exclusive Tonka tinys vehicle and is compatible with every vehicle in the line. All Tonka tinys playsets can be connected to expand your Tonka Tinys world, giving lots of play value - and present ideas for long into the future! These are suitable for 5+. The range is excellent, with so much to choose from, so get down to Asda and see them all in store - you probably won't come home empty handed!. This massive (as toys go) vehicle is a superbly built product which is designed to dig, dump, and haul. The first thing you will spot is its large working bucket, which you can try out in the box to see how well it works; it's really solidly made and works with a satisfying 'clunk'; The handle can be used to lift the scoop up/down and in/out. The vehicle runs on big deep cleated tyres which run smoothly over all sorts of surfaces. The body of the vehicle is made from heavy-duty steel and it will definitely withstand the most enthusiastic of games. It offers hours of fun in the sandpit (as long as you have a big sandpit! ), in the garden or on the beach. Our local park has a large sandy play area which is absolutely ideal for this superb vehicle - and it garnered plenty of admiring looks! This is a really well-built classic toy that will survive almost anything - and still last to be passed on to another generation. The loader is great for imaginative and role play, especially if your child is lucky enough to have a whole collection - or friends with some. You can see the whole range of Tonka Steel here. "Tonka’s Steel range is a long standing classic. 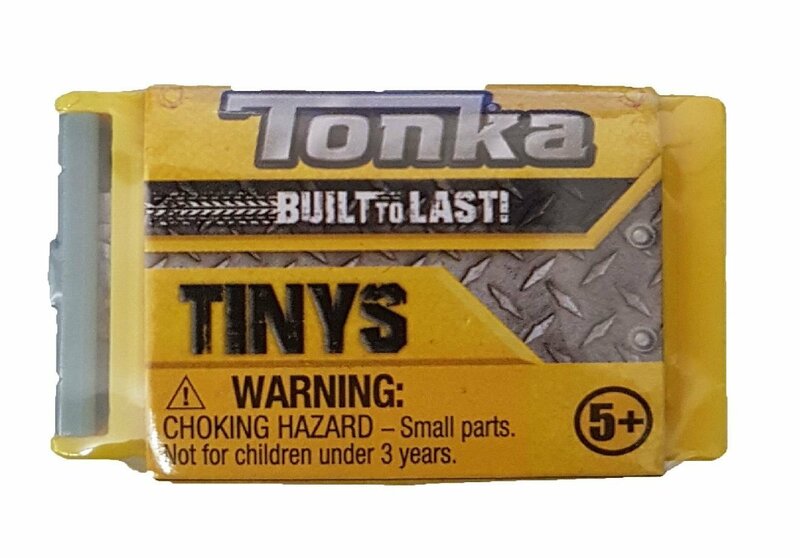 Tonka Steel is the perfect way for kids to enter a whole world of construction play. These rough and ready vehicles are made from real steel and include a variety of cranes and trucks to choose from, plus chunky tyres mean going off road won’t be a problem!"